Loyalty and Rewards/Incentive Cards are used to reach out to customers or employees, always reinforcing your brand and keeping them happy. 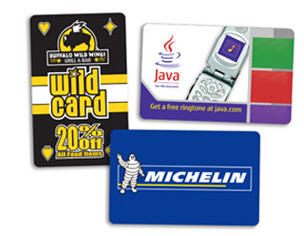 They can be printed in a variety of shapes or sizes, in addition to the standard credit card size. Please contact Plastic Works to discuss the many options offered. Bar-Code, Magnetic Stripe, Variable Information, Scratch-Off Panel and Write-On Back are also available.